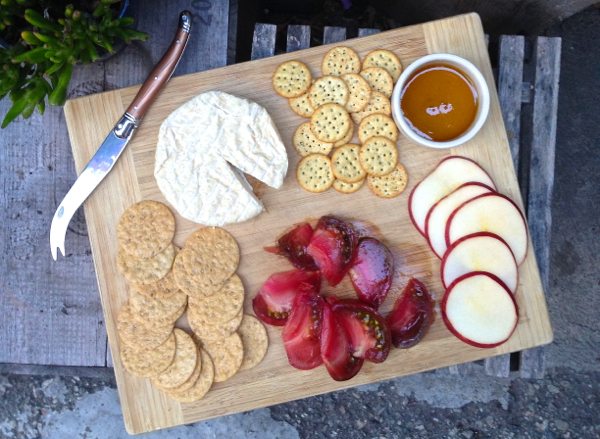 2013′s first at-home cheese platter featured store-bought cheese (Kite Hill White Alder omggggg), but it was still pretty special with ruby heirloom tomatoes, gluten-y and gluten-free crackers, thin-sliced perfectly crisp apples, and my honey’s amazing homemade vegan “wildflower honey”. Special indeed. 2013 was many things. Good things and sad things and changing things and loving things and geeze, this year had lots and lots of feelings. It was also a year of making and doing, of moving and shaking and creeping and crashing. Undoubtedly, a very creative year. I will write about all of this soon – about the peaks and valleys, and all about the painful and passionate adventure that 2013 turned out to be. But right now I want to write about cheese, k? 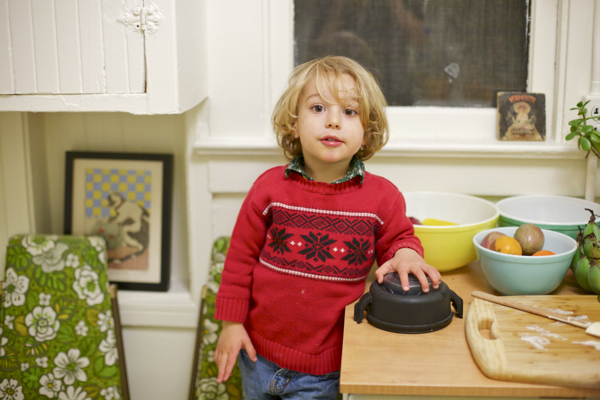 Look at that wee little mister, almost exactly a year ago now, December of 2012 and helping me to prep our very first ever homemade gourmet vegan cheese – the Hard Gruyère from Artisan Vegan Cheese. What can I say about vegan cheese making? It sure has come a long way since I first started doing it, 4 or 5 years ago. Back then it was all The Book That Shall Not Be Named (unnamed out of respect, because that book did serve us well for so many years, when it was all we had and before we figured out a few important tricks), with it’s overly-mustardy mixtures, too-tangy tahini bases, and raw nut chèvres that could never quite stand up to a sharp knife . . . or even a hard cracker. Yeah, the vegan cheese-scape was a barren one indeed, until, in the summer of 2012, our little fromage-deficient lives were flipped upside down when one Miyoko Schinner exploded onto the modern vegan scene with her groundbreaking book, Artisan Vegan Cheese (aka AVC). Hello, game changer. 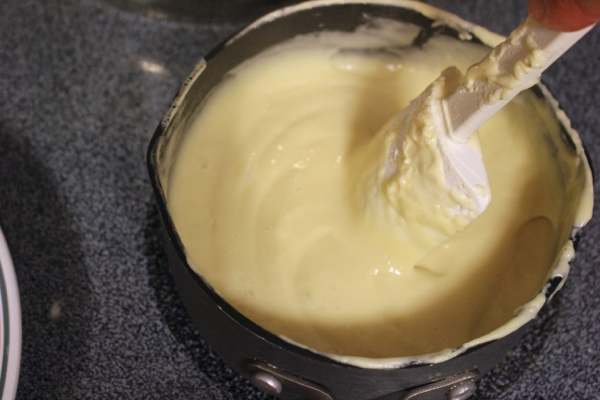 Left: First stage of Air-Dried Cheddar, plus basic Sour Cream. Right: baked mac n cheese made with Hard Gruyère, all from Artisan Vegan Cheese. AVC was the first to elevate amateur vegan cheese making to artisanal levels. 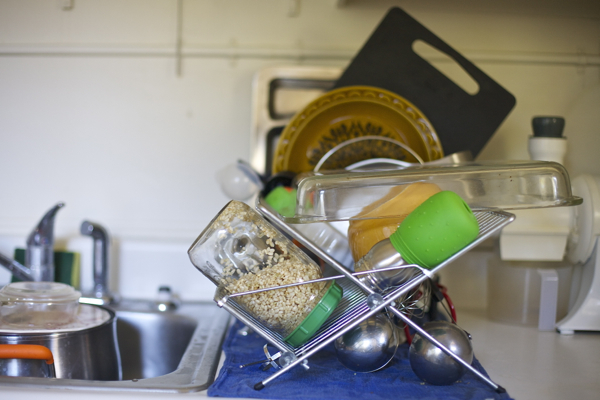 It’s by no means a simple process, and although the book does have a few “quick cheeses” the vast majority are time-, prep-, and energy-intensive labors of love. Which is okay, if you’re a food geek like me and 98.7% of all the other vegans I’ve ever met, who really enjoy a good kitchen project. AVC cheeses are almost all fermented and aged, relying primarily on yogurt or rejuvelac as the culturing agent. Plain soy yogurt can be purchased at most major grocery stores, but rejuvelac will probably have to be made from scratch. It’s not a difficult endeavor (at all), but it’s lengthy and thus requires foresight. 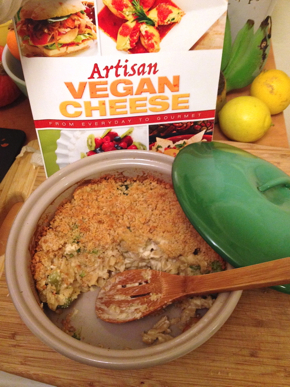 And that’s one downside to the recipes in Artisan Vegan Cheese – they’re not exactly “spur of the moment” material. Sprouts a-sprouting on the dish rack. This is the first step in making rejuvelac, a multi-day undertaking. All in all, so far we’ve made five cheeses from Artisan Vegan Cheese: the Hard Gruyère, the Air-Dried Cheddar, the Sour Cream, the Air-Dried Gouda, and the Pub Cheddar With Chives. Some of them, like the gruyère, were mind-melting amazing. Others, like both of the cheddars, seemed out of balance (oily, or . . . “sweaty”?) or just texturally off (gritty, not creamy). We – that’s my man and I – also had some issues with mold and exterior texture on the aged cheeses – the cheddar and the gouda. However, all of this could have been due to user error. As with any fine craft, I’m sure that there’s a steep learning curve at the start. 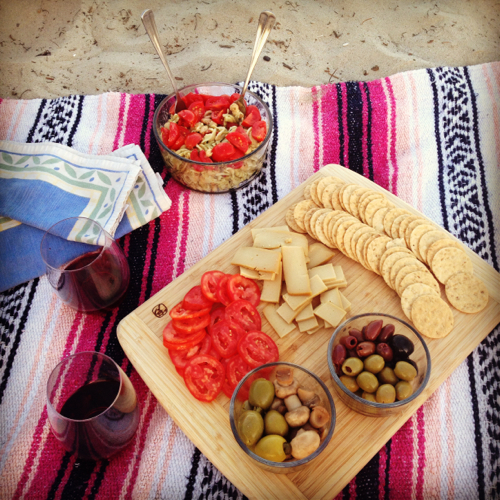 A beach picnic at sunset is the perfect place for a little vegan antipasto platter. Air-Dried Gouda from AVC, with fresh roma tomatoes, olives and marinated mushrooms, and gluten-free crackers. 2013 may be drawing to a close, but I’m not done with Artisan Vegan Cheese yet, oh not by any means. As a big proponent of fermented foods, I love that the cheeses in this book are cultured and aged and therefore teeming with beneficial probiotic bacteria. Next up on the list? Air-Dried Parmesan for pasta deliciousness, Meltable Mozzarella for pizza margherita amazingness, and Oat American Cheese (because what what??). I’m hoping that the learning curve levels out, and I’ll have better luck with more reliable results in the future. Wish me luck! An impromptu afternoon cheese plate on the banks of the Potomac river in Maryland, summer 2013. This spread offered an assortment of fruits, pickles, and gluten-free crackers, but the star of the show was definitely the Muenster from The Non-Dairy Formulary. The Non-Dairy Formulary (NDF) made its quieter entrance into the vegan cheese-scape in early summer 2013, with little fanfare. Offered independently by the incredible Skye Michael Conroy (aka The Gentle Chef), The Non-Dairy Formulary is a self-published, text-only, vegan cheese makers dream come true. It’s really really amazing! The recipes in this book are mostly soy milk-based, as opposed to AVC which mostly relies on soaked cashews and yogurt. 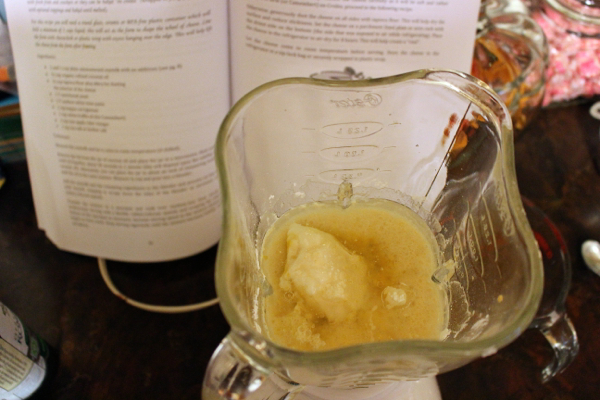 There’s also a chapter on tofu cheeses, and a few that call for soaked cashews. But primarily the recipes start with soy milk, just like dairy cheese begin with dairy milk. I’ve found the finished NDF cheeses to be so incredibly rich and creamy, and I think the milk is why. It all starts in the blender . . . So far in the NDF we’ve made the Muenster, the Brie, the Sour Cream, and the Mediterranean Herbed Feta. The Muenster was firm but creamy, perfectly sliceable. It had a bit of an unfortunate mustard tang (sooo hate tasting mustard in my vegan cheese!) but overall it was good. The Sour Cream was cashew-based and very similar to the AVC version. The Mediterranean Herbed Feta was made from tofu, and a pretty traditional preparation. The real star so far has been the Brie – seriously the best homemade vegan cheese I’ve ever tasted. BEST. There are so many recipes I want to try in The Non-Dairy Formulary, I don’t even know where I’ll start. Maybe the Crème fraîche? The Pepper Jack, or the Alpine Swiss? My man and I have already decided that 2014 will be The Year Of Gluten-Free Bread Baking, and lawd knows we’ll need some mighty fine cheese to accompany all that boule and baguette . . . Late-night cheese plate! 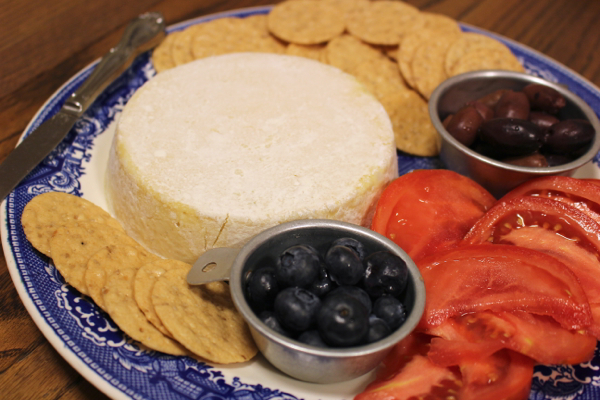 Non-Dairy Formulary Brie with gluten-free crackers, kalamata olives, garden tomato, and blueberries. So yeah, 2014 is going to be an exploration of gluten-free vegan bread baking, and we’re pretty darn excited. (Got any good book recs?) But that doesn’t mean there won’t be time for cheese making along the way. And if these two awesome books weren’t enough to keep us busy, apparently there’s a whole new tome awaiting us – The Cheesy Vegan! It’s hard, guys, doing this sort of down and dirty in-the-trenches research. But I’ll do it for you. I’ve got forward momentum and I’ve got to keep it moving. These next few weeks will be pretty much madness, but I think I can do okay as long as I can stay one step ahead. But that means no official blogging for me. I’d wanted to post a vegan/eco-friendly gift guide, but I just wasn’t able to make it happen. Then a few days ago Gena busted out this amazing post and you should go there, because she pretty much covers it all. Thanks lady! So my friends, I will see you ’round. ‘Round the internets, ’round this blog in the comments, and maybe in a Love List or two, and before we know it, ’round about next year. All my love to all of you! Happy Holidays!!! A friend and I are starting a vegan cheese club in 2014, and we’re using AVC and NDF as our jumping-off point! Love this review, love that you’re taking a blogging hiatus to keep moving forward, and cannot wait to read all about your adventures in gluten free baking. 2013 was my year of gf baking (sub-foci: not relying on gums / grinding my own flours) so hit me up if you have any questions! Awesome Post! love it! Your blog is definitely one of my favorites so I’ll miss you during your hiatus but good luck with everything and Happy Holidays! AVC – is a pretty great book. I’ve had fun using it as well. 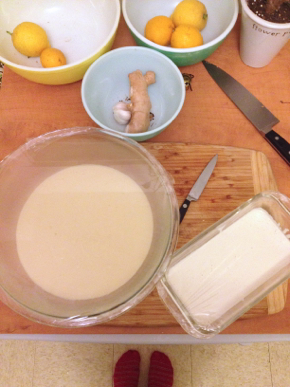 I’ve had a lot of luck with the cashew cream cheese, the almond ricotta – so good! – the Cheddar, the Brie is fantastic and so is the Chevre. Except for the Brie and Chevre I use the recipes she had in VegNews last December, they’re updated versions and the ones in the book are a little different. I had problems with mold on my Gouda. However the parts that weren’t moldy were delicious! The NDF is also amazing but I’ve only made 2 Cheeses from it. Sharp White Cheddar and the Blue Cheese. Both were great, and so easy! Can’t wait to try the rest! The Cheesey Vegan looks amazing, and a lot simpler. I own it, but haven’t had the chance to make anything yet. I look forward to reading all about your gluten-free bread baking. I love baking bread, it’s so much fun! I’ve only tried making gluten-free bread a coulpe of times using Jennifer Katzinger’s book “Gluten-Free and Vegan Bread” the bread turned out good, but apparently the book has a lot of errors. I haven’t experienced problems yet myself, but a lot of the reviews on Amazon are negative because of this. Great post! Your journey has been an inspiration. Here is to a healthy and happy 2014. Can’t wait to hear about the cheese making adventures! Vegan cheese club = awesome! Basically, super strong intelligent awesome women who do their own thing and do it with flair. Yup. And yay for long-haired little boys! Did the Blue Cheese in NDF taste, well, bleu? Like, was it all stinky and stuff? I want a bleu cheese soooo bad, but I;ve held off on making either of them basically because I don’t want to be disappointed. I miss stinky cheese! Thanks for the g-f recs, I’ll check ‘em out. Happy holidays! Thanks Andrea, and I hope you have a great holiday as well! The Almond Ricotta was definitely good. It’s actually the kind of recipe I would have passed over too, except last year I got to see Miyoko do a few demo’s from AVC at Chicago Vegan Mania. The Almond Ricotta was one of those recipes and she used it in Stuffed shells. It was probably one of the best stuffed shell recipes I’ve ever had. Very similar to what I remember dairy stuffed shells to be like. So that’s the only way I’ve used the ricotta, but I’ve been thinking about trying some other things with it. The vegan cream Cheese from AVC is also very good. I’ve made it several times and it tastes great on a bagel with some blueberry jam. I’ve made the brie three times now, and it’s been a winner every time. I haven’t yet tried the brie in NDF but the AVC one actually gets a bit of a rind on it, which is awesome. Miss that, you know? and the inside is so creamy! You know, it’s been a long time since I had dairy blue cheese, so I can’t remember the exact taste. It wasn’t stinky – but the flavor I would describe as pungent. If I remember correctly he uses either onion or garlic powder in the recipe and that flavor is somewhat noticeable, but overall I thought it was great. I loved the blue veins that the spirulina makes – made it look authentic at least, and certainly it’s the best vegan blue I’ve had to date. You’re welcome for the g-f recs. Wish I had more for you but since i’m not gf myself I don’t have a ton of experience baking that way. Thanks for the reviews of the two books. I have AVC, but was discouraged with the extra step of soaking cashews, and I’m sooo looking forward to checking out the Non-Dairy Formulary. It sounds like it has great potential. I can’t believe a few people are starting a vegan cheese club. That is totally brilliant! If I have any success (and the required patience), I’d definitely consider getting involved in a club like that! Oh I forgot to mention if you don’t feel like making rejuvelac you could always use Kombucha instead. That’s what I do and I’ve had great luck with GT’s Original Kombucha. I wish you all the luck for your classes and everything else in the year to come. Did you see this recipe? It looks a bit too easy…. WOW evolutionary biology! Master’s? PhD? Research? Teach? See where it takes you? You go girl, so exciting, enjoy all the learnin and readin and writin and immersin. I miss grad school! You have made me soooo excited about these two books. At first, I didn’t know which one to buy. Now, I’m getting both!!! Uh, Jo’s book is still wonderful. Nothing will ever beat Gee-Whiz. Sorry. I love, love, love AVC. I’ve made several recipes: air dried gouda, brie (attached to camembert recipe, cheddar) all with no mold issues or textural issues. I have a tendency to use a bit more than 1/2 tsp salt on the outside before drying. I follow instructions and if I don’t get good coverage with a half tsp, I add more which is why I probably haven’t seen any mold growth. I find that this does not over-salt the cheeses either. The gouda and brie have been my favs of the air dried. The cheddar got really thick in my pan, really fast and while it’s still good, I thought the others were amazing. I’ve also made the pub cheddar did not really care for that one. Both cheddars were smooth, not gritty issues, but the flavor of the oub cheddar was a little off to me. I adore the cream cheese (holy heck on a vegan bagel with guava jam–YES) and think it’s the best vegan cream cheese I’ve ever had. Also, loved the gruyere and made the buffalo mozz from VegNews. The mozz was totally cool because it was so similar in appearance to dairy cheese. You even store the cheese balls in water, so they look totally authentic. I liked the texture, but the flavor was not there for me. Lacked salt and some other umami-ness that I can’t put my finger on. I plan to finish the air dried chapter–I tried the parm once, but couldn’t get enough liquid out of my yogurt. I’m going to try it in the deydrator next time. ps. I found that rye berries make super quick, bomb dot com rejuvelac! Better than brown rice and quinoa for me. If you want a relationship with someone. you will be a Controller of your dating men or Ladies,I want you to consider that your problem has been solved with the spiritual power of this Ring. It is a great powerful Ring of love that when you fix it in your finger, whoever sights you or you shake hands with must automatically fall in love with you faithful,kind,loving. This Ring has been existing for over 10 years now. If you approach anybody with this Ring, he or she must surely obey your command and your request. If you are looking for a new job, fix the ring in your finger and proceed to the office where you are looking for the job. You will be so surprised how you will be welcomed and received in the office.If you are contesting for any election post, the power of this ring will attract the heart of the people to you. You can also consider yourself to be rich because of the power of love of people towards you.it is great treasures.whoever connected with you it very powerful love Ring for the attract the love ones. Gluten free on a shoestring bakes bread. My family has a lot of allergies and she has subs for making these lovely breads vegan! I haven’t made any vegan cheese, but our love for pizza pressed me to learn making vegan cheese at home. 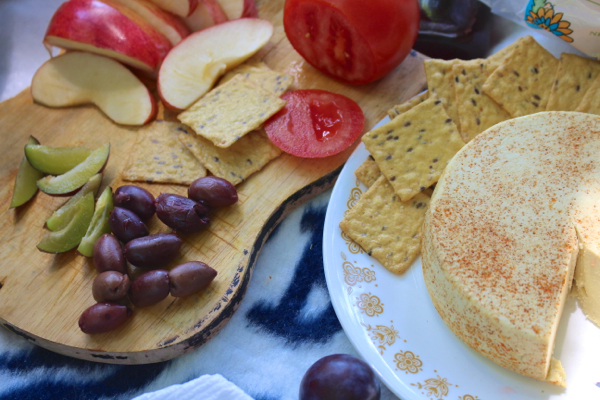 None of the vegan cheese out there is good – I hate them all! I do have a question, have you tried making the mozzarella cheese by either of the books you mentioned above? If so, can you kindly let me know which method you would prefer and why? I want to say I want to purchase both books, but I cannot at the moment, but I want to start making the mozzarella first. Your feedback is greatly appreciated!